Speaker of the House Nancy Pelosi could see her party's majority slip away in the 2010 elections, says one analyst. “Dancing with the Stars” booker alert: Nancy Pelosi is a natural pick for next season. “When I was a teenager, I wanted to dance,” Pelosi told a cluster of cross-legged kids gathered around her chair during the speaker’s annual take-your-child-to-work-day press conference Thursday. 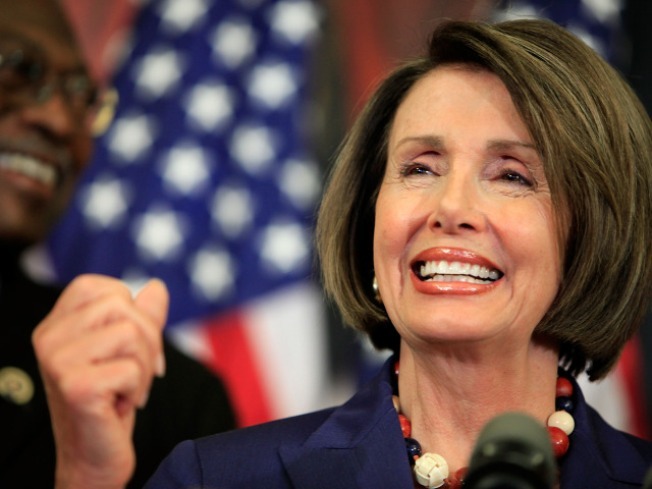 “I don’t mean dance professionally, just dance,” Pelosi said. “Just dance!” And, with that – and a smile — the highest-ranking woman in American government gave a little shimmy-shimmy-shake of her shoulders. It was a highlight of Pelosi’s 30-minute Q-and-A session with pint-sized prodigies of journalists and congressional aides – and a reminder that sometimes the most revelatory answers come from softball questions. The “real” reporters in the room got about half as much time to grill the speaker on the Eric Massa scandal, regulating the financial services industry and immigration reform. The truth is, there wasn’t much going on in the House on Thursday; the centerpiece of the week’s planned agenda, a D.C. voting rights bill, had been scuttled and lawmakers were headed out of town at midday. But every year without fail and regardless of what ‘s happening in politics, the upstart amateurs at the press conference get more out of Pelosi than the grizzled professionals. This year was no different. Pelosi didn’t give up much new information – until the give-and-take with the kids, when her tough exterior gave way to a maternal mien. Of course, she got the “Meet the Press” question: Will she run for president? “I love the job that I have, and I believe that one of the reasons that I do it with the success that I have is that my members know that I’m here for them, for the House of Representatives, and I’m not thinking of another [position] for myself,” Pelosi explained. No need to go into the challenges of a woman running for president – or those facing a San Francisco liberal whose approval rating stood at 11 percent when it was measured by CBS last month. If you guessed the landmark health care overhaul, you’re wrong. “[The] most difficult one I have had in this past year is to get our members to vote for the war in Afghanistan and Iraq,” Pelosi said. After the press conference, troop leader Pelosi guided a few dozen kids on a short tour. Donnelly also made the same observation about Pelosi that got Sen. Tom Coburn (R-Okla.) a round of raised eyebrows from conservatives. “She was nice,” Donnelly said – adding that the speaker was “funny,” too. The biggest kick sprang from Pelosi’s admission that she was more consumed with Elvis than Eisenhower as a youngster. She told the kids that kicking off her dance shoes to run for office hadn’t yet crossed her mind when she was their age. Majority Leader Steny Hoyer of Maryland, who usually cuts a rug with the speaker at the annual Democratic Issues Conference, says Pelosi can still make her way around the dance hall. “We’re good partners both on the House floor and the dance floor,” he said. Pelosi didn’t have to show off her skills on Thursday, though. No need to tap-dance around the kids’ questions.